Hey y’all! 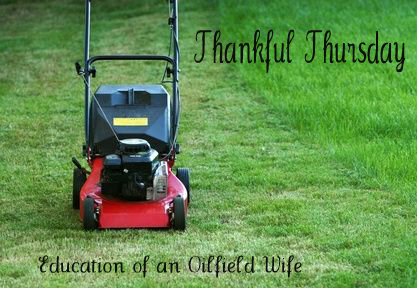 It’s Thursday, which means another installment of Thankful Thursday and today, I am thankful for…my push mower! Before I started on my walk with the Lord, I would have given myself credit for that realization. Now, I know that it is God talking to me when I feel that sudden peace come over me. Our yard is about half an acre, with a decent slope throughout, and it took me two days to finish, but finish I did. I know that I will have to get back out there again in a few days to mow, but I will try to keep a thankful attitude and be grateful for my push mower. What are you thankful for today? Leave a comment, send me a tweet, or post on my FB page!